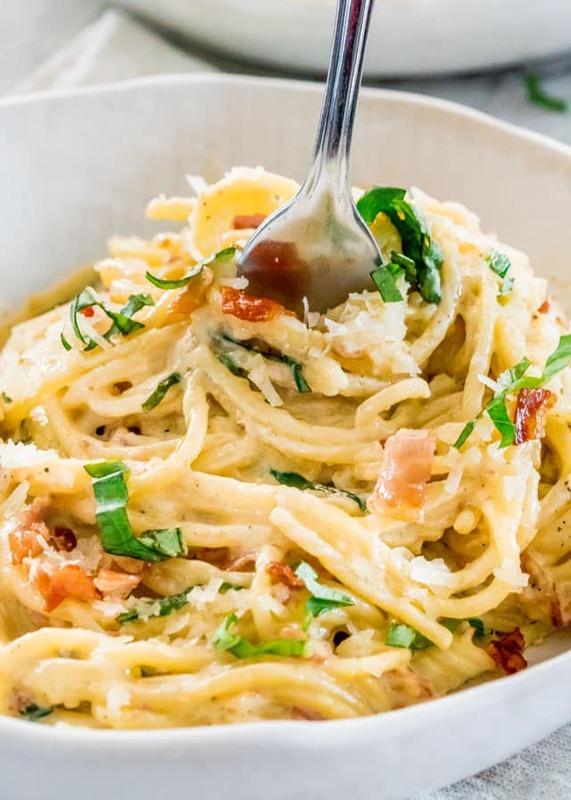 This Creamy Carbonara is a plate of heavenly, creamy pasta. 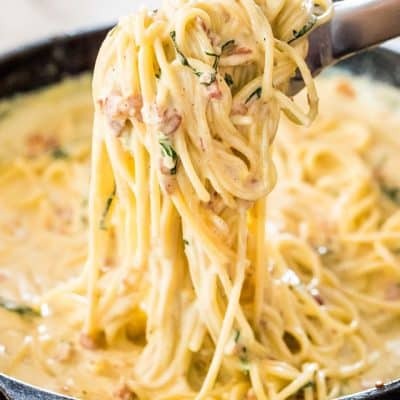 Silky spaghetti with crispy pancetta in a super creamy and cheesy sauce. Simply delicious and so easy to make them at home. In case you were not aware, bacon, pancetta or prosciutto is a vegetable! In fact, bacon is my husband’s favorite vegetable. Or at least that’s what he’d like to hope it is. Recently we’ve been trying to eat more chicken and fish and less pork and beef. However, every once in a while, I like to cheat a little. 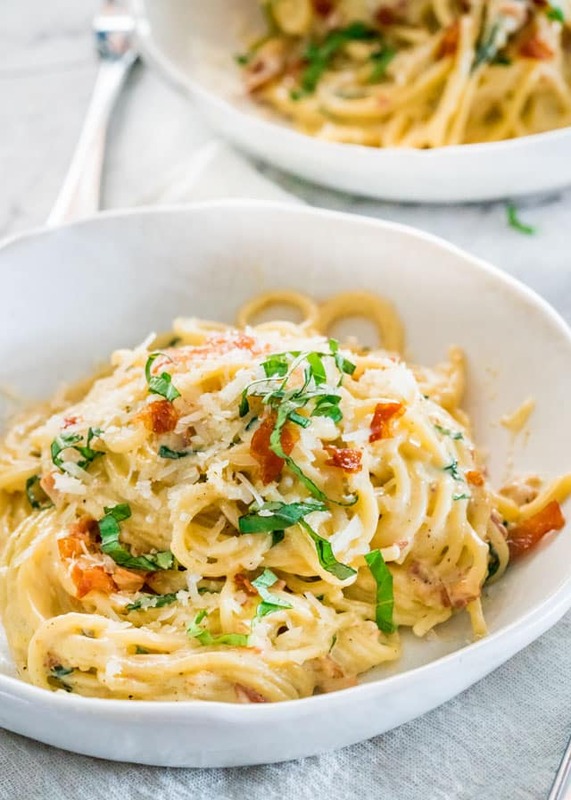 And if we’re talking about cheating, let’s cheat in style with this heavenly, creamy, cheesy carbonara that’s loaded with crispy pancetta. Because that’s how you cheat! If you’re watching you’re calorie intake, you might want to skip this recipe and go straight to my healthy recipes. If you are not, stick around and you won’t regret it, because this could be the best creamy pasta you’ll ever eat! Carbonara is an Italian pasta dish that can be made with spaghetti, fettuccine, rigatoni or bucatini. The main ingredients in it are cheese, bacon, eggs and black pepper. It’s a simple dish, and I think that this simplicity is what makes this dish a star. According to wikipedia, this dish was first made as a hearty meal for Italian charcoal workers which gave rise to the term “coal miner’s spaghetti”, which is used to refer to spaghetti alla carbonara in parts of the United States. The word Carbonari means charcoalmen. Interesting, eh? I love finding out little facts like this. Bring a large pot of salted water to boil over high heat. Add the pasta and cook according to package instructions. Drain and set aside. Add the pancetta to a large skillet and saute over medium-low heat until crisp, about 8 minutes. Transfer the pancetta to a bowl using a slotted spoon. Add the half and half to the skillet and bring to a simmer. Whisk the egg yolks into the sauce. Whisk in the Parmesan cheese. Stir in the black pepper. Taste for salt and season if needed. I find no salt is needed since the cheese adds plenty of saltiness. 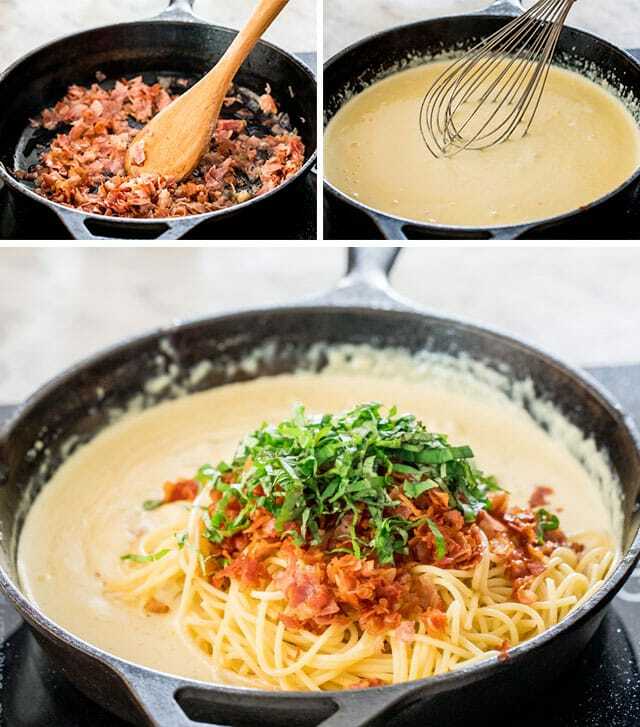 Add the cooked spaghetti, bacon and basil to the skillet and toss well to combine. Garnish with more Parmesan cheese if desired and serve immediately. Leftovers: Store leftovers in an airtight container for 3 to 4 days. Make sure to refrigerate within two hours of cooking. I prepared this for dinner last night and the family loved it. A keeper. I did omit the egg just because I was short on time. Thank you! 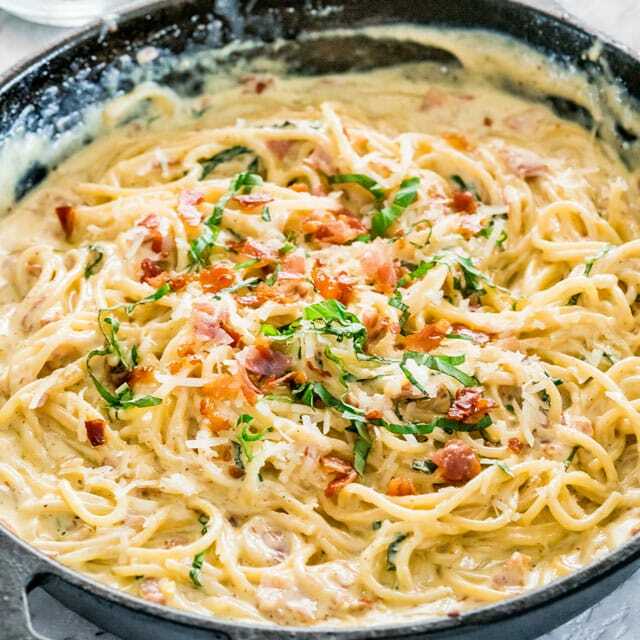 Can you make th creamy carbonara without egg/egg yokes? I have trouble with the eggs “cooking” and some of my family do not particularly like eggs. I omitted the egg and it was great. However, I did saute onion for flavor……. I’m sure this is a great recipe, I’m just not a great cook. I had the half and half simmering and stirred in the egg yolk, but I ended up with scrambled egg. How do I make sure this doesn’t happen again. You can temper the yolks first. Take a few tablespoons of the hot cream, and slowly drizzle it in the yolks as you whisk quickly. Pour this mixture back into the pan while whisking everything together. Can I use evaporated milk instead of half and half? You can! It will definitely have an evaporated milk flavor, if you like that. Love this recipe. I’ve made this using bacon when no pancetta is available in a pinch. Never add more salt. Use variety of grated cheeses for this, tuemrns out wonderful always. Sometimes I add roaster red peppers or roasted red peppers. Omgoodness. Oh I love roasted red peppers! Is sounds like your sauce broke! There are any reasons this can happen to a creamy sauce. Give this a read! I’ve never had a carbonara before, but here I sit craving it as though it was my favorite dish! My daughter is pregnant, so I’m blaming sympathy cravings. First recipe I find is this one and it has made my mouth water. I will definitely be making this one! Thank you!! Incoming, new favorite meal! This is fantastic! Incredibly delicious! Thank you for the recipe. My sons made this for their father on Father’s Day. He can’t eat onion or garlic. This recipe was simple to make, full of flavour and delicious! Will definitely make again. Thanks Jo. Made this for the first time while camping with friends! We all loved it. Had some fresh green beans so sauteed them and added them to the fun. I doubled the recipe and ended up being too much. So for the leftovers, we used it and made Spaghetti Pie – easy & amazing! Glad you liked it, love spaghetti pie! To make a more authentic and less calorific carbonara skip the half and half entirely. Cook the pasta for 10 mins. In a skillet gently fry off garlic, butter and pancetta (pancetta optional). Add the cooked drained pasta to the skillet. Add the beaten eggs and grated parmesan and stir through for a couple of minutes. Top with more parmesan and black pepper to serve. 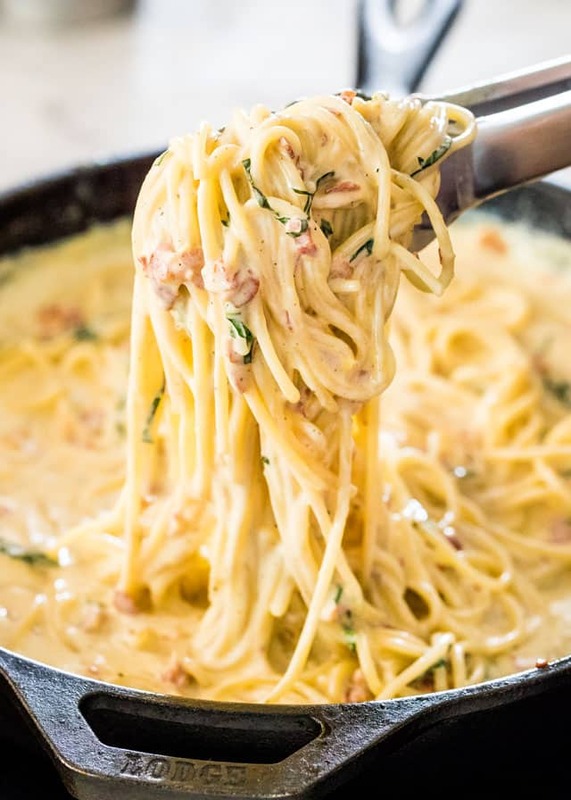 Agreed, but this is a creamy carbonara, so the half and half is needed. Just made this and loved it!! My 7 year and 9 year old cleared their plates. My so. Asked for 2nd’s. I will definitely be making this again. Thank You for the great recipe. I made this for my family last night and they all love it. 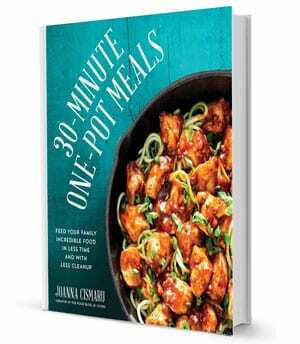 Thank you Jo for such a quick and easy recipe. 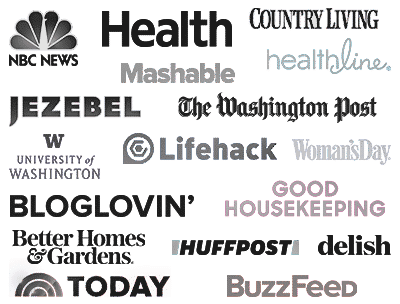 Are you able to recommend a non pork meat substitute? You could try uncured beef or turkey bacon. You could even skip it, I suppose.